NASA's Curiosity rover, giving earthlings a glimpse of its ultimate target, has beamed back spectacular high-resolution photos of the rugged foothills of Mount Sharp, showing a khaki-colored landscape marked by towering hills, gaping canyons and sand dunes reminiscent of the American southwest, scientists said Monday. In one view, the rover photographed a scientifically intriguing transition from relatively flat rock beds made up of water-influenced minerals to steeply inclined unhydrated layers marking a dramatic, geologically sudden discontinuity that signals a major change in martian history. 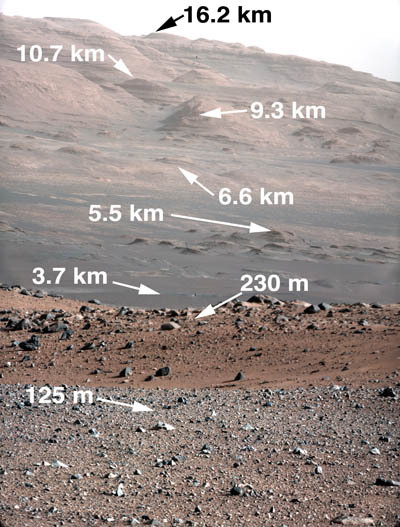 But for sheer visual impact, it was a zoomed in view of the Mount Sharp foothills that provided the most stunning vista, showing the nearby gravel-strewn field, a sudden drop off into a partially hidden impact crater, dark dunes and then gaping canyons between hills and mesa-like features making up the lower slopes of the towering 3-mile-tall mound of layered terrain. "When those of us on the science team looked at that image for the first time you get this feeling, 'that's what I'm talking about,'" said Project Scientist John Grotzinger. "That is why we picked this landing site. Although the anticipated scenic beauty was not something that was at the top of the list for reasons to select it, it was certainly one thing we were hoping would come through one day. It's awesome to see this." All of the discernible layers in the zoomed-in image "are the layers from orbit that contain the hydrated phyllosilicates and sulfates," Grotzinger said, referring to clay-like minerals that formed in the presence of water. "So everything in that image there is a science target for us. And again, the goal here is to drive up (the side of Mount Sharp) eventually (and) when we do, there's a very systematic approach to exploring, moving around through this terrain that looks like it was something that comes out of a John Ford movie." Curiosity landed in Gale Crater on Aug. 6 and since then, engineers have been methodically checking out its complex systems and science instruments. So far, no major problems have been found, with the latest tests showing one of the rover's critical sample analysis laboratories -- the Sample Analysis at Mars, or SAMS instrument -- is working as expected. Curiosity currently is poised to study rocks that were exposed when the rover's sky crane landing rockets blasted topsoil away during the final seconds of the descent. Its first major scientific target is an area known as Glenelg, about 1,300 feet away to the east, where three types of terrain come together. The rover is expected to remain near Glenelg for the rest of the year before striking out toward Mount Sharp sometime in early 2013. Despite the rugged nature of the terrain seen Monday, engineers believe the rover eventually will be able to safety climb up into the foothills of Mount Sharp. "We're going to be driving the rover around in these valleys and looking up at these hills and finding the places where the strata come down and intersect the topography that the rover can drive through," Grotzinger said. "We know it can, because there's so much great data from orbit that allowed us to simulate the drives before we chose this landing site to demonstrate that we could make it up through this terrain." The image in question was "white balanced," said camera designer Mike Malin, "with a little less blue than normally comes in with white balance. I do this because it looks pretty to me, and it's also a geologically interpretable image. I like to look at things as they would look like on the Earth. 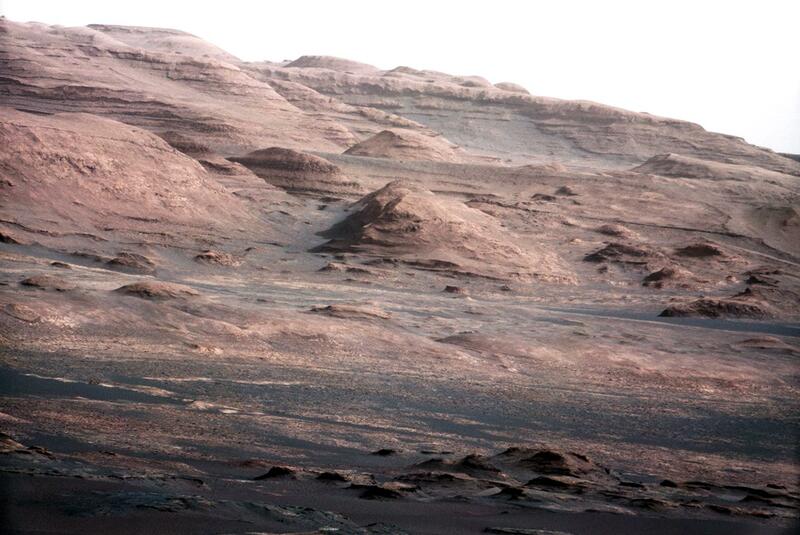 On Mars it's a little more khaki color, also a little pink on top of that." The science team was especially exited by shots showing the transition from relatively level to steeply inclined beds. "What you see in this image (is) a transition from the strata that are almost flat line, not quite, and they're full of the hydrated minerals, to strata above them, which do not obviously contain the hydrated (water-infused) minerals," Grotzinger said. "Now we don't know from orbit whether they are absent those spectral responses because they're covered with dust or because they're truly absent. But the striking thing about it, everything above that (transition) is steeply inclined with respect to everything that's below it." "This is a spectacular feature that we're seeing very early on that you only had the slightest hint from orbit. ... This kind of relationship is something that can help us understand the origin of these strata, that clearly are the result of the exhumation of the larger sequence of strata that created Mount Sharp." Studying the images from orbit and the latest photos from Curiosity, the science team senses "a big change up Mount Sharp and one day we hope, towards the end of our mission, to get up and go across that (transition) to check it out," Grotzinger said. 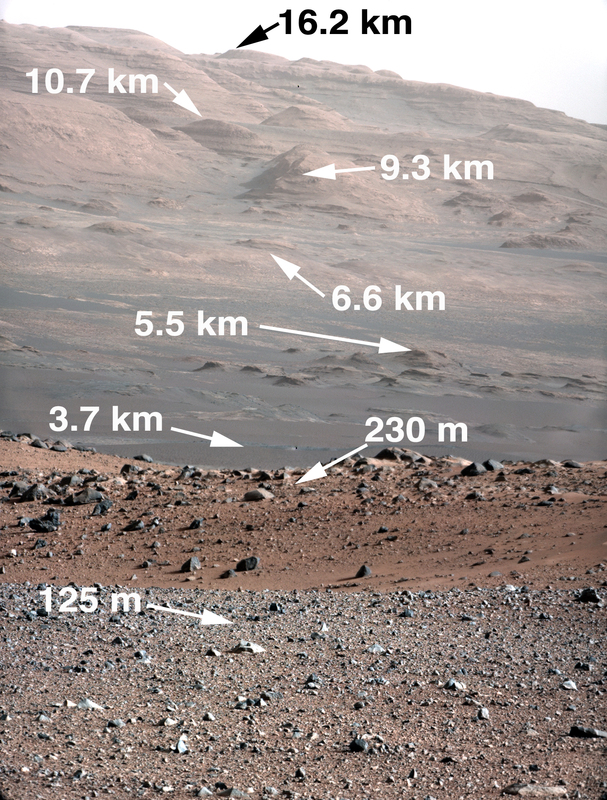 Malin provided labeled images showing the distances to the foothills and a zoomed-in view showing a boulder about five miles away that is roughly the same size as Curiosity. "That gives you an idea of the scale of the hills and the canyons we'll be driving on," he said. "Basically, this is the ultimate goal, this is where we want to get in the next year and a half or two years, this is the place we want to be. This is 10 kilometers away, and it would take the rover, even if the rover were driving flat out, a hundred days to get there. "We're not going to drive flat out because we have science to do as well. So it's going to take us a while to get over there."